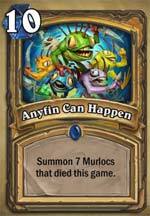 Pojo's Hearthstone & Warcraft news, tips, strategies and more! discuss the Online RPG, discuss Hearthstone & more! Tuesday, February 9, 2016 BMoor stops by today with a new Article comparing Magic: The Gathering to Hearthstone. If you are a MTG player looking to learn about Hearthstone and how it is similar/different to/from Magic, give it a read! - Magic: The Gathering Vs. Hearthstone. We're also thinking about starting up a Hearthstone Card of the Day section up, and we're looking for some volunteers. If you play Hearthstone and feel like sharing your thoughts on cards with others, please drop us an email. Friday, February 26, 2012 "Travel back in time with the Timewalkers to mend a broken past in Timewalkers: Betrayal of the Guardian, the twentieth set for the World of Warcraft Trading Card Game. Based on Blizzard Entertainment's award-winning massively multiplayer online role-playing game, this second set of the Timewalkers block pays homage to the eras of Warcraft and Warcraft 2, as players will encounter even more legendary characters and weapons from Warcraft lore, like General Turalyon, Orgrim Doomhammer and Atiesh, Greatstaff of the Guardian." Read more in	Today's Warcraft News! Tuesday, October 2, 2012 Cryptozoic Entertainment today announced the qualifiers for Season 8 Realm Qualifiers for the TCG. Running from November through April, local hobby stores worldwide will host the qualifiers, given players six months to qualify for the invitation-only Realm Championships, held in May 2013 at locations around the world. At each Realm Qualifier, players can earn points toward their Championship invitation. Read more in	Today's Warcraft News! Thursday, June 14, 2012 Cryptozo ic Entertainment today expanded the World of Warcraft Trading Card Game with the release of its eighteenth card set, Aftermath: Tomb of the Forgotten. Read more in	Today's Warcraft News! Monday, April 30, 2012 There' s a new format for the WOWTCG: Contemporary Constructed. "The format will be a non-rotating (as opposed to Core, where blocks rotate out periodically) Constructed format featuring all cards from Year 5 (Worldbreaker Block) and forward. The format will be played with Best-of-1 matches, in the same way as Core Constructed." Read more on Cryptozoic's site today. Monday, January 31, 2012 Launching in spring 2012, decks representing five different monstrous villains and courageous heroes will be available, each complete and ready to play right out of the box. Players can select from Hogger (gnoll warrior), Murkdeep (murloc shaman), or Emberlimb (ancient druid) on the monster side, and Lady Jaina Proudmoore or Dark Lady Sylvanas Windrunner on the hero side. With these powerful characters leading the charge, the Champion Decks will provide both new and experienced players a competitive deck for casual and tournament play at local hobby store Battleground events. Read more in	Today's Warcraft News! Friday, December 9, 2011 Cryptozoic Entertainment yesterday announced the release of the 2011 Fall Class Starter Decks for the World of Warcraft Trading Card Game which is based on Blizzard Entertainment's award-winning massively multiplayer online role-playing game. These new Class Starter Decks build on the successful launch of Wave 1 in Spring 2011 and include 13 additional reprints of popular rare and epic cards from recent sets. Read the Full Press Release in Today's Warcraft News! Thursday, December 1, 2011 "Cryptozoic Entertainment today announced plans to develop and publish a highly accessible new "deck-building-style" card game based on Blizzard Entertainment's World of Warcraft. Designed for two to four players and featuring many of the most recognizable figures from the award-winning massively multiplayer online role-playing game, World of Warcraft: Clash of Champions will introduce all-new gameplay elements to the deck-building genre." Read the Full Press Release in Today's Warcraft News! 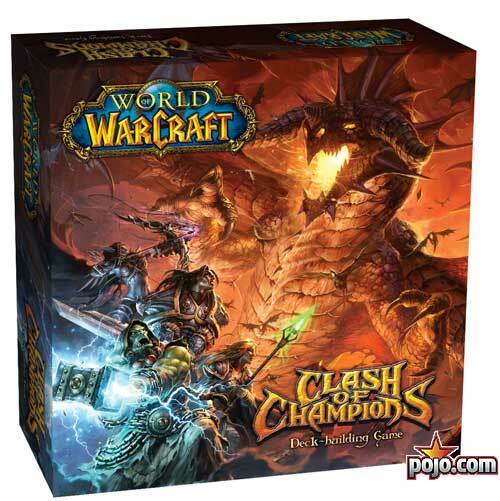 Cryptozoic Entertainment today announced the release of the 2011 Fall Class Starter Decks for the World of Warcraft® Trading Card Game which is based on Blizzard Entertainment's award-winning massively multiplayer online role-playing game. These new Class Starter Decks build on the successful launch of Wave 1 in Spring 2011 and include 13 additional reprints of popular rare and epic cards from recent sets. Wednesday, November 16, 2011 "Cryptozoic Entertainment just released three new dungeons for you to explore and reclaim. Form a party with two friends to take on Lord Godfrey, Scarlet Commander Mograine, and Vanessa Van Cleef. You don't need a pilot for the Dungeon Deck. The deck plays itself! You can customize the Dungeon Deck for difficulty and your hero will level up as you gain experience. Spend those experience points improving your deck and adding cards. So, group up and strike a blow to the enemy. For the Horde! For the Alliance! For the Monsters!" Read the Full Press Release in Today's Warcraft News! Thursday, November 3, 2011 Cryptozoic Entertainment today announced the official release date for its new Fall 2011 Class Starter Decks for the World of Warcraft Trading Card Game. The Fall 2011 Class Starter Decks will release on December 6, 2011. Cryptozoic also announced that due to the overwhelming retail demand for the Fall 2011 Class Starter Decks they have sold out on its initial manufacturing run. Upon release, World of Warcraft Trading Card Game players will be able to purchase the product through the distribution and hobby channels while supplies last. Read the Full Press Release in Today's Warcraft News! Monday, June 20, 2011 Konami has obtained the exclusive rights from Cryptozoic Entertainment to distribute the World of Warcraft Trading Card Game in Japan. Read the Full Press Release in Today's Warcraft News! Thursday, May 26, 2011 "Cryptozoic Entertainment’s motto of “fans first” has once more carried over to its newest project, as it offers fans the opportunity to read World of Warcraft and Starcraft manga for the first time ever in digital format! Beginning May 26, 2011, fans will be able to download their favorite manga titles on the iPad, iPhone and iPod Touch. To celebrate the exclusive release of Blizzard manga on the Cryptozoic Comics app, Cryptozoic is offering a free download of the full 160-page manga, Warcraft: Legends Vol. 1, for the first week of its release (through June 2nd)!" More details in Today's Warcraft News! Thursday, May 12, 2011 Cryptozoic Entertainment announces the creation of a new gaming convention: Epic Con! Epic Con is a traveling convention that brings the best in gaming to your local community. Epic Cons will take place across the United States, with scheduled events in 2011 in Las Vegas and Philadelphia. Wednesday, April 27, 2011 Cryptozoic Entertainment today announced release plans for Worldbreaker: Twilight of the Dragons, the fifteenth expansion to date for the World of Warcraft Trading Card Game. The set will debut in July 2011. More details in Today's Warcraft News! Cryptozoic Entertainment announces the creation of a new gaming convention: Epic Con! Epic Con is a traveling convention that brings the best in gaming to your local community. Epic Cons will take place across the United States, with scheduled events in 2011 in Las Vegas and Philadelphia. Tuesday, April 12, 2011 Cryptozoic E ntertainment today announced that May 24 it will expand the World of Warcraft Trading Card Game, with the release of a new batch of Class Starter Decks for 2011, updating the popular 2010 line that introduced countless players to the game. More details in Today's Warcraft News! Cryptozoic Entertainment™ today announced release plans for Worldbreaker: Twilight of the Dragons, the fifteenth expansion to date for the World of Warcraft® Trading Card Game, which is based on Blizzard Entertainment's popular massively multiplayer online role-playing game. The set will debut in July 2011. Also, we'd love to start our Warcraft Card of the Day back up. If you are playing WoW TCG and feel like sharing your ideas with others, please drop us an email. Or if you'd like to write articles on Warcraft, you can drop us an email as well. Tuesday, March 22, 2011 Cryptozoic Enter tainment announces the release of the World of Warcraft Trading Card Game’s fourteenth expansion to date, Worldbreaker: War of the Elements, with new streamlined rules that make the game easier to pick up for new players. More details in Today's Warcraft News! "Cryptozoic Entertainment is pleased to announce that they have signed a long-term licensing agreement with Blizzard Entertainment. The multi-year arrangement grants Cryptozoic the right to produce the trading card game (TCG) based on Blizzard Entertainment's hugely popular World of Warcraft massively multiplayer online role-playing game series. Cryptozoic will continue to expand the World of Warcraft TCG for years to come. Players will soon have a slew of exciting new cards to test their skills and defeat their opponents with at the upcoming Continental Championships in June and the World Championship in August. The first product release from Cryptozoic will be the Wrathgate boosters in May followed by the Class Decks in June." - More details here. Tuesday, January 12, 2010 "Taking advantage of the buzz, popularity and outstanding attendance records of Gen Con Indy, the Upper Deck Company has decided to host its fourth annual World of Warcraft Trading Card Game (TCG) World Championships this year to coincide with North America’s largest hobby gaming convention. Upper Deck’s 2010 World of Warcraft® TCG World Championships will be held alongside a Darkmoon Faire and many other Public Events at Gen Con Indy from August 5 though 8 at the Indianapolis Convention Center." We have more details in our News Section today. Monday, December 28, 2009 The Upper Deck Company announced the release of the Naxxramas Raid Deck. We have more details in our News Section today. Wednesday, November 4, 2009 The Upper Deck Company is proud to announce that its 2009 Season 4 World of Warcraft Realm Championships will be taking place this month at a Realm near you. On November 14 - 15, World of Warcraft Trading Card Game players from around the globe will gather at one of 21 different Realms to compete for fame and prizes totaling more than $24,000 per venue. " - We have more details in our News Section today. Saturday, October 17, 2009 Billy Postlethwait Crowned World of Warcraft TCG World Champion, taking home $50k! More details in Today's News. Wednesday, October 7, 2009 The 2009 WoW World Championships are this weekend in Texas. More details in Today's News. Saturday, September 19, 2009 Darkmoon Faire Amerstam draws 3,000 people. You can read more about it in Today's News. 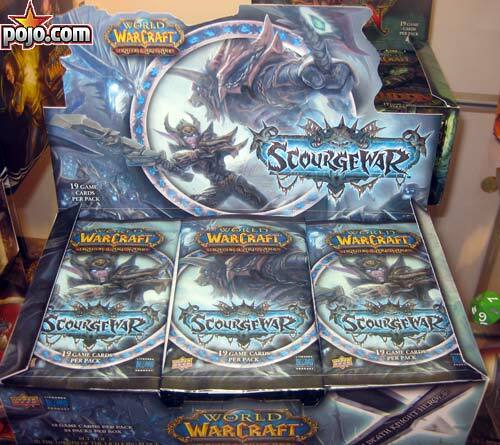 Monday, September 14, 2009 Upper Deck has unveiled new World of Warcraft Scourgewar Loot Cards. You can get a Spectral Kitten, Tiny Mounts, and more. You can see images of the loot you'll receive in Today's News. Friday, Aug 21, 2009 "The Upper Deck Company will once again be at the center of attention this weekend during the fourth annual BlizzCon event, which is being held Friday and Saturday, August 21-22, at the Anaheim Convention Center. As in years past, Upper Deck will bring a full schedule of World of Warcraft Trading Card Game and Collectible Miniatures Game tournaments to BlizzCon. There will be events for both new players and experienced competitors alike featuring awesome prizes like Apple iPods and Spectral Tiger and El Pollo Grande Loot cards!" - We have more details in our News Section today. Tuesday, Aug 18, 2009 The next WOW TCG expansion will be ScourgeWar. UDE had some booster mockups on display at GenCon. I snapped a photo while I was there. Click on the image for a larger photograph if you are interested in the booster art. Tuesday, Aug 4, 2009 Uppper Deck to Unveil Event-Exclusive World of Warcraft® Miniatures Figure at Gen Con! 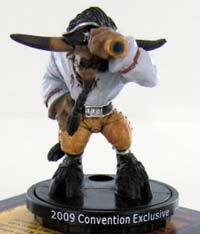 Carlsbad, CA (August 4, 2009) – At next week’s Gen Con Indy trade show at the Indiana Convention Center, the Upper Deck Company will be unveiling and selling an event-exclusive World of Warcraft Miniatures Figure: Fleet Master Seahorn! The game’s latest character introduces a new game mechanic to World of Warcraft Minis: quests! “This is an extremely exciting time for us, as this will be the first t ime players will be able to interact with a Questgiver,” said Margeaux Sullivan, Upper Deck’s World of Warcraft Miniatures Brand Manager. Upper Deck will be selling the Fleet Master Seahorn figure for $9.99 at its company booth from Thursday, August 13, through Sunday, August 16, while supplies last! Click on the image to see a larger photo of Seahorn. Monday, July 13, 2009 "Upper Deck Entertainment is pleased to announce the new Achievements system for its hobby-exclusive “Battlegrounds” program. Starting this month at hobby stores worldwide, players participating in the World of Warcraft Trading Card Game Battlegrounds program will now be able to earn new rewards by virtue of completing tasks. In addition, players will earn Badges of Justice and ally Tokens rewards as well as tally “Achievement” points on their way to becoming their store’s “Battlegrounds Master.” We have more details in our News Section today. Tuesday, June 16, 2009 The Ninth WoW Expansion Launches Today: Fields of Honor. Fields of Honor introduces a new way to play the World of Warcraft TCG: Warsong Gulch rules. Use your existing World of Warcraft TCG cards with an alternate rules set, which will be included on some UDE Points cards. Horde and Alliance Flag cards will be randomly inserted to assist with this fun style of play. We have more details in our News Section today. Tuesday, June 16, 2009 Upper Deck Entertainment is pleased to continue its celebrated line of trading card games by opening up an entirely new dimension of the World of Warcraft TCG with its Death Knight Deluxe Starter on June 16. Every 36-card Death Knight starter deck includes three Ghoul token cards. The 17-card Death Knight pack includes one new hero and 16 other exclusive cards to enhance the Death Knight class." We have more details in our News Section today. Wednesday, May 20, 2009 "The Upper Deck Company is pleased to announce that its next World of Warcraft Trading Card Game expansion, Arena Grand Melee, launches worldwide today. However, Arena Grand Melee provides unique content from the World of Warcraft MMO’s popular Arena gameplay, which opens up an entirely new dimension for TCG players." We have more details in our News Section today. Thursday, May 7, 2009 "The Upper Deck Company is pleased to announce the release of Spoils of War, the first expansion set within its hugely popular World of Warcraft Miniatures Game. Featuring 51 new premium collectible, prepainted miniatures and available in three-figure randomized booster packs, the Spoils of War collection features iconic World of Warcraft® heroes and monsters including the sought-after Lady Vashj!" Friday, May 1, 2009 The Upper Deck Company has announced its 2009 Season 3 Realm Championships will be taking place at a Realm near you. On May 16 and 17, World of Warcraft Trading Card Game players from around the globe will gather at one of 18 different Realms to compete for fame and prizes totaling more than $10,000 per venue. Players will be battling for prizes that include a $2,500 travel voucher, electronics, and other exciting rewards. In addition, the WoW Miniatures Game Realm Championships will be held simultaneously at the same venues as the WoW TCG competitions and will feature a similar lineup of prizes. We have more details in our News Section today. Thursday, March 26, 2009 Blood of Gladiators launched worldwide on Tuesday, March 24, 2009. We have more details in our News Section today. Tuesday, March 10, 2009 UDE's “Spectral Safari" is this weekend. It features a Spectral Tiger Loot card as the grand prize. The event will take place at locations around the world, and each location will reward the winner with a Spectral Tiger Loot Card. The “Spectral Safari” is a great, low-cost, opportunity for MMO players to try the new Minis Game, and to get a shot at winning the hottest Loot Card yet. We have more details in our News Section today. Sunday, March 1, 2009 Upper Deck’s announces new Loot items coming in Blood of Gladiators, the latest World of Warcraft TCG expansion, launching on March 24th. We have more details in our News Section today. I'm especially fond of the Foam Sword Rack myself. Thursday, February 5, 2009 Upper Deck’s announces an upcoming Organized Play event for the World of Warcraft Miniatures Game, the “Spectral Safari, featuring a Spectral Tiger Loot card as the grand prize. The event will take place at locations around the world, and each location will reward the winner with a Spectral Tiger Loot Card. The “Spectral Safari” is a great, low-cost, opportunity for MMO players to try the new Minis Game, and to get a shot at winning the hottest Loot Card yet. We have more details in our News Section today. 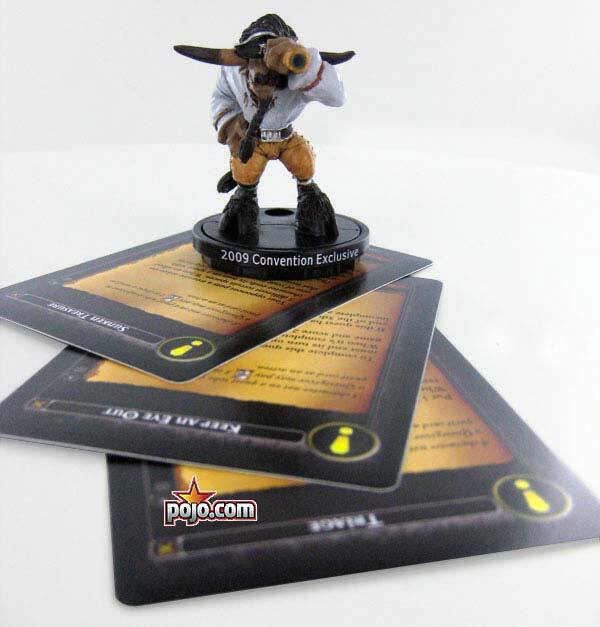 Thursday, January 15, 2009 Upper Deck Announces Upper Deck Day: "Upper Deck Day will feature both the World of Warcraft Trading Card Game and the World of Warcraft Miniatures Game. All gamers are invited to enter the free TCG beginners event and learn first hand what all the buzz is about. The World of Warcraft TCG brings the action of the online game to the table top, with all the same strategy and action in the cards! Players can earn booster packs and start building their own World of Warcraft TCG collection with their free Starter Decks. Door prizes will also be given out all weekend." Full details in the News Section of our YUGIOH Site. UDE also announce Battlegrounds Tourney's for minis. We have more details in our News Section today. Tuesday, December 9, 2008 The Worl d of Warcraft Miniatures Deluxe Edition, hits streets today, and features six total figures (three each from two different factions), as well as one of three high quality game maps, an enhanced Beginner’s Guide, UBases, Character and Action Bar cards for each figure, and custom dice. Additionally, each Deluxe Edition guarantees the player a World of Warcraft Drums of War Loot card! We have more details in our News Section today. Friday, October 24, 2008 WOW Minis News: Upper Deck sent free demo kits to over 1,500 hobby stores, so that the stores could provide free demos to anyone interested in the game. The kits are arriving in stores this week, and UDE is outreaching to fans to let people know that they can go to their local store this weekend and check out the game. We have more details in our News Section today to help you find a store near you. Also, UDE announces the 2009 “Road to Worlds,” including the schedule of Organized Play events for the World of Warcraft TCG. We have more details in our News Section today to help you find a store near you. Sunday, October 19, 2008 UDE announced the results of the 2008 WOW TCG World's Championship in a Press Release today. More details in our News Section. Friday, October 17, 2008 UDE announced the date & location of 2009 WOW TCG World's Championship in a Press Release today. More details in our News Section. Monday, September 29, 2008 UDE announces WOW Minis to hit streets on Nov. 11th. We have more details in our News Section today. Monday, July 28, 2008 UDE announces 2008 World Championships. We have more details in our News Section today. Wednesday, July 23, 2008 Blizzard & UDE have a look behind the WOW scene at Comic-Con this Friday. We have more details & images in our News Section today. Thursday, July 17, 2008 GenCon Indy 2008 Update - Win exclusive prizes at Upper Deck’s plethora of World of Warcraft TCG tournaments! - "Upper Deck has announced lots of World of Warcraft Gen Con news over the past few months. But don’t worry – amidst all the excitement we haven’t forgotten about tournaments! Throughout Gen Con, World of Warcraft fans can test their skills in a variety of TCG contests. The Last Chance Continental Qualifier offers a final opportunity to qualify for the 2008 Continental Championship. In the Gadgetzan Challenges, winners earn their choice of a 160GB iPod Classic, a 16GB iPod Touch, a Wii, an Xbox 360, a PlayStation 3, or a $300 Best Buy Gift Card. The winner of each flight also qualifies for Sunday's Gadgetzan Championship, with the victor receiving either a MacBook Pro or Dell XPS gaming laptop! We’re also featuring a Ladies Only Championship, where the winner gets a Mac Book, plus a Spectral Safari Tournament, with the victor in that event getting a coveted Spectral Tiger Loot card! There’ll also be a Bounty Tournament where players will have an opportunity to be paired against an Upper Deck or Blizzard staffer: beat them, and you’ll receive a special prize. Regardless of whether you’re just starting out or a long-time World of Warcraft TCG expert, there’s a tournament for you!" Thursday, July 10, 2008 UDE sent us a Press Release about new In-Game Tabards that can be bought with UDE points. We have more details & images in our News Section today. Thursday, June 19, 2008 UDE sent us a Press Release about new loot items in the upcoming World of Warcraft Trading Card Game release, The Hunt for Illidan. And don’t miss The Hunt for Illidan Sneak Preview this weekend! We have more details & images in our News Section today. o Ethereal companion - Code 3333"
Tuesday, June 17, 2008 UDE sent us a Press Release today saying the Ogre Smash & Bash Event. We have more details in our News Section today. Tuesday, April 22, 2008 UDE sent us a Press Release today saying "that the U.S. version of the World of Warcraft TCG’s expansion set, Servants of the Betrayer, is sold-out". We have more details in our News Section today. Friday, April 11, 2008 The first few weeks of the World of Warcraft TCG March of the Legion Tour have been finalized. The Tour starts next weekend (April 18-20) with stops at four stores in Wisconsin. On Monday the 21st, the Tour kicks off a week-long adventure through Ohio, plus stops in Pennsylvania, Indiana and Kentucky (April 21 -27). The Northern California leg is April 25-27, followed by stops in Florida, Massachusetts and Michigan on May 2-4. Not sure why, but we're having a hard time finding Warcraft COTD volunteers. We've had success on our other sites (pokemon, yugioh, magic, etc), but not here. We'll start the COTD back up if we can find some more volunteers. ;-) If you play the WoW TCG and feel like sharing your thoughts on cards with others, please drop us an email. Wednesday, March 19, 2008 UDE sent us a Press Release about a "March of the Legion Tour", to be hosted at select local hobby stores across North America starting in April. We have more details in our News Section today. Friday, March 14, 2008 I had to duck out of the office early yesterday, and missed posting the COTD. So you get two today. Our WoW Cards of the Day are Wrath & Cyclone. Jimby has reviews for you today. Tuesday, March 11, 2008 Our WoW Card of the Day today is Blademistress Lyss. Jimby has a review for you today. Sunday, March 9, 2008 Our WoW Card of the Day today is Hammer of Wrath. DeadEndMikie & Jimby have reviews for you today. Thursday, March 6, 2008 Our WoW Card of the Day today is Champion Zosimuus. DeadEndMikie & Jimby have reviews for you today. This past Saturday, Samwise Didier and Glenn Rane took part in a book signing for World of Warcraft: The Art of the Trading Card Game near Los Angeles, CA. We have images and details in our News Section today. Tuesday, March 4, 2008 Our WoW Card of the Day today is Sanctity Aura. DeadEndMikie & Jimby has a review for you today. Thursday, February 28, 2008 Our WoW Card of the Day today is Reaver of the Infinites. Ivnmetal & Jimby have reviews for you today. Tuesday, February 26, 2008 We have a couple new COTD reviewers joining the Review Crew today - Ivnmetal & JImby Our WoW Card of the Day today is Reaver of the Infinites. DeadEndMikie also joins in with a review for you today. Tuesday, February 5, 2008 We have details on the upcoming “Spectral Safari,” event - a global one-day World of Warcraft® Trading Card Game (TCG) tournament in our News Today. We also have details of the Servants of the Betrayer Booster Packs coming in April in News Today. Friday, January 25, 2008 Our WoW Card of the Day today is MorDotz. DeadEndMikie has a review for you today. Thursday, January 24, 2008 Our WoW Card of the Day today is Tinkermaster Overspark. DeadEndMikie has a review for you today. Wednesday, January 23, 2008 Our WoW Card of the Day today is Pauldrons of the Crimson Flight. DeadEndMikie has a review for you today. Tuesday, January 22, 2008 Our WoW Card of the Day today is Reaver of the Infinites. DeadEndMikie has a review for you today. Monday, January 21, 2008 Our WoW Card of the Day today is Stronghold Gauntlets. DeadEndMikie has a review for you today. Thursday, January 17, 2008 Our WoW Card of the Day today is Skullflame Shield. DeadEndMikie has a review for you today. Wednesday, January 16, 2008 Our WoW Card of the Day today is Rise to the Challenge. DeadEndMikie has a review for you today. Tuesday, January 15, 2008 Our WoW Card of the Day today is Invulnerable Mail. DeadEndMikie has a review for you today. Monday, January 14, 2008 Our WoW Card of the Day today is the Two Handed Weapon: Destiny. DeadEndMikie has a review for you today. Friday, January 11, 2008 Our WoW Card of the Day today is Ring of the Unliving. DeadEndMikie & Phil have reviews for you today. Thursday, January 10, 2008 Our WoW Card of the Day today is Rest and Relaxation. DeadEndMikie & Phil have reviews for you today. Wednesday, January 9, 2008 Yesterday afternoon, one of my Arena Buddies came over and we were doing 2v2 matches, so forgive me for not getting the COTD up Tuesday. So today you get 2 COTD's! Our WoW Cards of the Day are Echoes of Shifting Sands & Boat to Booty Bay.. DeadEndMikie and Phil have reviews for you today. Phil Novikov to the COTD team today as well! Friday, December 14, 2007 You get 2 COTD's today (as I forgot to post Thursday's ... DOH!) Our WoW Cards of the Day are is Marksman Boriz and Axe of the Legion. Gijs, DeadEndMikie & KJFJustice have reviews for you today. Wednesday, December 12, 2007 Our WoW Card of the Day today is Bizzazz. Gijs, DeadEndMikie & KJFJustice have reviews for you today. Tuesday, December 11, 2007 Our WoW Card of the Day today is Bizzazz. Gijs, DeadEndMikie & KJFJustice have reviews for you today. Monday, December 10, 2007 Our WoW Card of the Day today is Hemet's Elekk Gun. Gijs, DeadEndMikie & KJFJustice have reviews for you today. Wednesday, December 5, 2007 Our WoW Card of the Day today is the March of the Legion card: Bloody Welcome. DeadEndMikie & Spoonman have reviews for you today. Tuesday, December 4, 2007 Our WoW Card of the Day today is the March of the Legion card: Drain Mana. DeadEndMikie has a review for you today. Wednesday, November 28, 2007 Our WoW Card of the Day today is the March of the Legion card: Rulrin. Gijs, DeadEndMikie & KJFJustice have reviews for you today. Tuesday, November 27, 2007 Our WoW Card of the Day today is the March of the Legion card: Blinky. Gijs, DeadEndMikie & KJFJustice have reviews for you today. Monday, November 26, 2007 Our WoW Card of the Day today is the March of the Legion card: Ripper. Gijs & KJFJustice have reviews for you today. 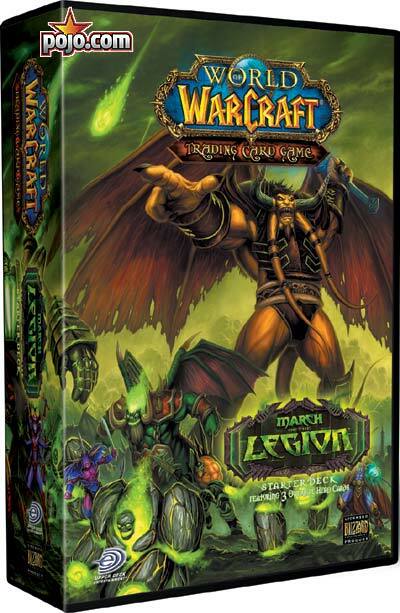 Wednesday, November 21, 2007 Our WoW Card of the Day today is the March of the Legion card: Haaroon. Gijs, DeadEndMikie & KJFJustice have reviews for you today. Tuesday, November 20, 2007 Our WoW Card of the Day today is the March of the Legion card: Scraps. Gijs, DeadEndMikie & KJFJustice have reviews for you today. Monday, November 19, 2007 Our WoW Card of the Day today is Thulthun. Gijs & KJFJustice have reviews for you today. Friday, November 16, 2007 Our WoW Card of the Day today is Treats for Great-father Winter from Feast of Winterveil. Gijs has a review for you today. Thursday, November 15, 2007 Our WoW Card of the Day today is The Reason for the Season from Feast of Winterveil. Gijs has a review for you today. Wednesday, November 14, 2007 Our WoW Card of the Day today is Mistletoe from Feast of Winterveil. Gijs has a review for you today. Tuesday, November 13, 2007 Our WoW Card of the Day today is Metzen the Reindeer from Feast of Winterveil. Gijs has a review for you today. Upper Deck sent us the information sheet outlining all the tournaments and activities that will be taking place at the upcoming WoW TCG World Championship from November 30 through December 2. Folks will be battling for the biggest grand prize payout in TCG history - $100,000!!! Full Details in Today's News. Monday, November 12, 2007 Our WoW Card of the Day today is Metzen the Reindeer from Feast of Winterveil. Gijs has a review for you today. Friday, November 9, 2007 Our WoW Card of the Day today is The Abominable Greench from Feast of WinterVeil. Spoonman, KJFJustice, DeadEndMikie & Gijs have reviews for you today. Thursday, November 8, 2007 Our WoW Card of the Day today is Great-father Winter from Feast of WinterVeil. Spoonman, KJFJustice, DeadEndMikie & Gijs have reviews for you today. Wednesday, November 7, 2007 Our WoW Card of the Day today is Greatfather Winter from Feast of WinterVeil. Spoonman, KJFJustice, DeadEndMikie & Gijs have reviews for you today. Tuesday, November 6, 2007 Our WoW Card of the Day today is PX-238 Winter Wondervolt from Feast of WinterVeil. Spoonman, KJFJustice, DeadEndMikie & Gijs have reviews for you today. Upper Deck unveiled 3 new Loot cards that are coming out in the next expansion set. UDE is also increasing your chances of finding Loot Cards. The set will feature Aldor and Scryer sub-factions, new keywords, and demonic allies. Full Details in Today's News. Monday, November 5, 2007 Our WoW Card of the Day today is Hardpacked Snowball from Feast of WinterVeil. Spoonman, KJFJustice, DeadEndMikie & Gijs have reviews for you today. Friday, November 2, 2007 Our WoW Card of the Day today is Holy Shield. KJFJustice, DeadEndMikie & Gijs have reviews for you today. Thursday, November 1, 2007 The "March of the Legion" TCG expansion and Sneak Preview will take place later this month. More details in Today's News. We have some images of the boosters too. Our WoW Card of the Day today is Lay on Hands. KJFJustice, DeadEndMikie & Gijs have reviews for you today. Wednesday, October 31, 2007 Our WoW Card of the Day today is Tewa Wildmane. KJFJustice, DeadEndMikie & Gijs have reviews for you today. Tuesday, October 30, 2007 Our WoW Card of the Day today is Sus'vayin. KJFJustice, DeadEndMikie & Gijs have reviews for you today. UDE sent us a Press Release today with more details on the the 2007 World Championships in San Diego next month, where the World Champ will take home a record breaking $100,000! Check out Today's News for full details. Monday, October 29, 2007 Our WoW Card of the Day today is Scout Omerrta. KJFJustice, DeadEndMikie & Gijs have reviews for you today. Friday, October 26, 2007 Our WoW Card of the Day today is Dismantle. KJFJustice, turkeyspit, DeadEndMikie & Gijs have reviews for you today. Thursday, October 25, 2007 Our WoW Card of the Day today is Deadly Poison. KJFJustice, turkeyspit, DeadEndMikie & Gijs have reviews for you today. Wednesday, October 24, 2007 Our WoW Card of the Day today is Blade Furry. KJFJustice, turkeyspit, DeadEndMikie & Gijs have reviews for you today. Tuesday, October 23, 2007 Our WoW Card of the Day today is Shiv. KJFJustice, turkeyspit, DeadEndMikie & Gijs have reviews for you today. Monday, October 22, 2007 Our WoW Card of the Day today is Kick. KJFJustice, DeadEndMikie & Gijs have reviews for you today. Friday, October 19, 2007 Our WoW Card of the Day today is Strength of Arms. KJFJustice has a review for you today. UDE will be offering a "World of Warcraft: The Art of the Trading Card Game" Hard Cover Book. This 288 page book releases in January. More details in Today's News. Thursday, October 18, 2007 Our WoW Card of the Day today is Surprise Attacks. KJFJustice has a review for you today. We received a Press Release today from Upper Deck about a new "Crafting Redemption Program" for the WOW TCG. Much like in the online game, “crafting” in the TCG allows players to collect various “crafting materials” that can be combined -- according to special recipes -- to be redeemed for exclusive equipment that can be used in the TCG, such as “Netherdrake Gloves,” a “Felsteel Reaper” or the “Girdle of Ruination.” More details in Today's News. Wednesday, October 17, 2007 Our WoW Card of the Day today is Tremor Totem. KJFJustice has a review for you today. Tuesday, October 16, 2007 Our WoW Card of the Day today is Unstable Affliction. KJFJustice, DeadEndMikie & turkeyspit have reviews for you today. Monday, October 15, 2007 Our WoW Card of the Day today is Vampiric Touch. KJFJustice, DeadEndMikie & cubeplayer have reviews for you today. Thursday, October 11, 2007 It's FOO Hero Week. Our WoW Card of the Day today is Kana Nassis. Cubeplayer has a review of this hero for you today. Tuesday, October 9, 2007 It's FOO Hero Week. Our WoW Card of the Day today is Deacon Markus Hallow. Dead End Mikie has a review for you today. Also, Cubeplayer, winner of the Holland Nationals, joins the Review Crew today! Friday, October 5, 2007 It's Resource Saver Week. Our WoW Card of the Day today is Diplomacy. KJFJustice & turkeyspit have reviews for you today. Thursday, October 4, 2007 It's Resource Saver Week. Our WoW Card of the Day today is Margaret Fowl. KJFJustice & turkeyspit have reviews for you today. Wednesday, October 3, 2007 It's Resource Saver Week. Our WoW Card of the Day today is Elemental Focus. KJFJustice & turkeyspit have reviews for you today. Upper Deck sent us a Press Release about the Darkmoon Faire in Philadelphia. This event takes place later this month. More details in Today's News. Tuesday, October 2, 2007 It's Resource Saver Week. Our WoW Card of the Day today is Band of the Ranger-General. KJFJustice & turkeyspit have reviews for you today. Hot News From Upper Deck today: "Just in time for the holidays, UDE will debut the very first gift set for the award-winning World of Warcraft TCG – The Feast of Winter Veil™ Collector’s Set (November). A perfect gift for World of Warcraft TCG and massively multiplayer online role playing game (MMORPG) players, the collector’s set will feature unique content from the online game’s holiday event, “The Feast of Winter Veil.” Each box will contain 10 exclusive game cards and two exciting new mini pet cards, as well as a booster pack from each of the previously released World of Warcraft TCG expansion sets (Heroes of Azeroth™, Through the Dark Portal™, and Fires of Outland™) and an exciting holiday deck box featuring artwork from the set. World of Warcraft TCG stocking stuffers also include the upcoming March of the Legion™ Starter Sets and Booster Packs (November), featuring Aldor and Scryer sub-factions, new keywords, demonic allies, and brand-new Loot™ cards." Monday, October 1, 2007 It's Resource Saver Week. Our WoW Card of the Day today is Stellaris. KJFJustice & turkeyspit have reviews for you today. Friday, September 29, 2007 It's Feral Druid Week. Our WoW Card of the Day today is Snig Feralsnout. KJFJustice, Spoonman, turkeyspit & Gijs have reviews for you today. Thursday, September 27, 2007 It's Feral Druid Week. Our WoW Card of the Day today is Call of the Wild. KJFJustice, Spoonman, turkeyspit & Gijs have reviews for you today. Oh, ... and Happy Birthday turkeyspit! Wednesday, September 26, 2007 It's Feral Druid Week. Our WoW Card of the Day today is Predatory Strikes. KJFJustice, Spoonman, turkeyspit, Gijs & DeadEndMikie have reviews for you today. Tuesday, September 25, 2007 It's Feral Druid Week. Our WoW Card of the Day today is Predatory Strikes. KJFJustice, turkeyspit, Gijs & DeadEndMikie have reviews for you today. Monday, September 24, 2007 It's Feral Druid Week. Our WoW Card of the Day today is Cat Form. KJFJustice, turkeyspit, Gijs & DeadEndMikie have reviews for you today. Friday, September 21, 2007 It's FoO Common Power Week. Our WoW Card of the Day today is One-Thousand Battles. KJFJustice, turkeyspit, Spoonman & DeadEndMikie have reviews for you today. Thursday, September 20, 2007 It's FoO Common Power Week. Our WoW Card of the Day today is Kagella Shadowmark. KJFJustice, turkeyspit, Spoonman & DeadEndMikie have reviews for you today. Wednesday, September 19, 2007 It's FoO Common Power Week. Our WoW Card of the Day today is Hurlorn Battlechaser. KJFJustice, turkeyspit, Spoonman & DeadEndMikie have reviews for you today. Tuesday, September 18, 2007 It's FoO Common Power Week. Our WoW Card of the Day today is Kulvo Jadefist. KJFJustice, Spoonman & DeadEndMikie have reviews for you today. Monday, September 17, 2007 It's FoO Common Power Week. Our WoW Card of the Day today is Shelley. KJFJustice, Spoonman & DeadEndMikie have reviews for you today. Friday, September 14, 2007 Our WoW Card of the Day today is The Fare of Lar'korwi. KJFJustice, turkeyspit & DeadEndMikie have reviews for you today. Thursday, September 13, 2007 Our WoW Card of the Day today is In Case of Emergency ... KJFJustice, turkeyspit & DeadEndMikie have reviews for you today. Wednesday, September 12, 2007 Our WoW Card of the Day today is Lost!. KJFJustice, turkeyspit & DeadEndMikie have reviews for you today. Tuesday, September 11, 2007 Our WoW Card of the Day today is The Ultimate Bloodsport. KJFJustice, turkeyspit & DeadEndMikie have reviews for you today. Monday, September 10, 2007 Our WoW Card of the Day today is When Smokey Sings, I get Violent. KJFJustice, turkeyspit & DeadEndMikie have reviews for you today. Friday, September 7, 2007 Our WoW Card of the Day today is Force of Nature. KJFJustice, Spoonman & DeadEndMikie have reviews for you today. Thursday, September 6, 2007 Our WoW Card of the Day today is Frost Funnel. KJFJustice, Spoonman & DeadEndMikie have reviews for you today. Wednesday, September 5, 2007 Our WoW Card of the Day today is Shadowfury. KJFJustice, Spoonman & DeadEndMikie have reviews for you today. Tuesday, September 4, 2007 I took Labor Day off, the COTD reviewers didn't ... so you get 2 COTD's today. The WoW Cards of the Day today are Consecration & Chain Lightning. DeadEndMikie & Spoonman have reviews for you today. Friday, August 31, 2007 Our WoW Card of the Day today is One Draenie's Junk. Gij's, DeadEndMikie, turkeyspit, KJFJustice & Spoonman have reviews for you today. Thursday, August 30, 2007 Our WoW Card of the Day today is Latro's Shifting Sword. Gij's, DeadEndMikie, KJFJustice & Spoonman have reviews for you today. Wednesday, August 29, 2007 Our WoW Card of the Day today is Sky-Hunter Swift Boots. Gij's, KJFJustice, Spoonman & DeadEndMikie have reviews for you today. Tuesday, August 28, 2007 Our WoW Card of the Day today is Slow. Gij's, Spoonman & DeadEndMikie have reviews for you today. Also, KJFJustice joins the COTD crew today. Monday, August 27, 2007 We're back from a long vacation & looking Fires of Outland cards this week in our COTD section. Our WoW Card of the Day today is Jubilee Arcspark. Gij's, turkeyspit & DeadEndMikie have reviews for you today. Friday, August 24, 2007 Congrats to Brad Watson who was crowned the National WOW TCG Champ. More details, and details on the upcoming World Championship are in Today's News Section. Thursday, August 23, 2007 We received a Press Release from Upper Deck about the Fire of Outland Expansion, which is available now. It's in our News Section today. Tuesday, August 21, 2007 S poonman has a Featured Article for you today titled: Reactive or Creative? We could use a few more volunteers the Card of the Day section. If you are playing WoW TCG and feel like sharing your ideas with others, please drop us an email. Or if you'd like to write articles on Warcraft, you can drop us an email as well. Tuesday, August 7, 2007 Our WoW Card of the Day today is another cool chase card from Fires of Outland - Gone Fishin'. KJFJustice, & DeadEndMikie have reviews for you today. Speaking of Going Fishing ... I'm taking a nice vacation for the first time in ages. We'll start updating again in Mid August. Monday, August 6, 2007 Our WoW Card of the Day today is the very cool chase card from Fires of Outland Spectral Tiger. KJFJustice, & DeadEndMikie have reviews for you today. Friday, August 3, 2007 Our WoW Card of the Day today is Lokholar the Ice Lord. KJFJustice, DeadEndMikie, turkeyspit & Red Comet have reviews for you today. Thursday, August 2, 2007 Our WoW Card of the Day today is Infernal. KJFJustice, DeadEndMikie, turkeyspit & Red Comet have reviews for you today. Wednesday, August 1, 2007 Our WoW Card of the Day today is Rain of Fire. KJFJustice, DeadEndMikie & Red Comet have reviews for you today. Tuesday, July 31, 2007 Our WoW Card of the Day today is Shadowburn. turkeyspit, KJFJustice, DeadEndMikie & Red Comet have reviews for you today. Monday, July 30, 2007 Our WoW Card of the Day today is Spirit Healer. turkeyspit & KJFJustice join the review crew today. DeadEndMikie chimes in as well. Friday, July 27, 2007 It's Epic Armor Week! Our WoW Card of the Day today is Netherwind Crown. Spoonman, DeadEndMikie & Gij's have reviews for you today. Thursday, July 26, 2007 It's Epic Armor Week! Our WoW Card of the Day today is Wall of the Dead. Spoonman, DeadEndMikie & Gij's have reviews for you today. Wednesday, July 25, 2007 It's Epic Armor Week! Our WoW Card of the Day today is Dragonstalker's Helm. Spoonman, DeadEndMikie & Gij's have reviews for you today. Tuesday, July 24, 2007 It's Epic Armor Week! Our WoW Card of the Day today is Bloodfang Hood. Spoonman, DeadEndMikie, Red Comet & Gij's have reviews for you today. Monday, July 23, 2007 It's Epic Armor Week! Our WoW Card of the Day today is Aegis of the Blood God. Spoonman, DeadEndMikie & Gij's have reviews for you today. Sunday, July 22, 2007 UDE has posted details on the newest Loot Cards from the Fires of Outland TCG expansion. Here's a link to check them out. The Spectral Tiger looks sweet! Friday, July 20, 2007 It's Fires of Outland Week! Storms knocked out my Internet on Thursday, so you get two COTD's today. Our WoW Cards of the Day today are Kiana De'nara & Chen Stormstout. Spoonman, DeadEndMikie, Gij's & Red Comet have reviews for you today. Wednesday, July 18, 2007 It's Fires of Outland Week! Our WoW Card of the Day today is Corki's Ranson. Spoonman, DeadEndMikie, Gij's & Red Comet have reviews for you today. Tuesday, July 17, 2007 It's Fires of Outland Week! Our WoW Card of the Day today is Latro's Shifting Sword. Spoonman, DeadEndMikie, Gij's & Red Comet have reviews for you today. Monday, July 16, 2007 It's Fires of Outland Week! Our WoW Card of the Day today is Shawn of the Dead. Spoonman, DeadEndMikie, Gij's & Red Comet have reviews for you today. Friday, July 13, 2007 It's Quest Week! Our WoW Card of the Day today is The Relics of Wakening. Spoonman, DeadEndMikie, Gij's & Red Comet have reviews for you today. Thursday, July 12, 2007 It's Quest Week! Our WoW Card of the Day today is Operation Recombobulation. Spoonman, DeadEndMikie, Gij's & Red Comet have reviews for you today. Wednesday, July 11, 2007 It's Quest Week! Our WoW Card of the Day today is The Haunted Mills. Spoonman, DeadEndMikie, Gij's & Red Comet have reviews for you today. Tuesday, July 10, 2007 It's Quest Week! Our WoW Card of the Day today is Felendren the Banished. Spoonman, DeadEndMikie, Gij's & Red Comet have reviews for you today. Monday, July 9, 2007 It's Quest Week! Our WoW Card of the Day today is Through the Dark Portal. Spoonman, DeadEndMikie, Gij's & Red Comet have reviews for you today. Friday, July 6, 2007 Our WoW Card of the Day today is Boneshanks. Spoonman, Gij's & Red Comet have reviews for you today. Thursday, July 5, 2007 Our WoW Card of the Day today is Katsin Bloodoath. Spoonman, Gij's & Red Comet have reviews for you today. Tuesday, July 3, 2007 Our WoW Card of the Day today is Tempest, Son-of-Storms (a Nats Promo). Spoonman, Gij's & Red Comet have reviews for you today. Monday, July 2, 2007 Our WoW Card of the Day today is Breanna Greenmother (a Nats Promo). Spoonman, Sinspawn & Red Comet have reviews for you today.